Minded approached us looking for a a complete website redesign as the were very dissatisfied with their previous website and the work that had been done on it. There was a very tight deadline for the work as the site was long overdue its launch date already. They were looking for a great working relationship after some negative experiences, and a website design that was useful and engaging for their users, and clearly represented their brand. The solution was to use a balanced colour scheme with striking, emotionally responsive imagery to create a harmonious design that nevertheless showed the professional and scientific background of their work. The site contains several different areas, aimed at different users groups so the structure needed to be designed carefully to ensurte the site was easy and clear to navigated. 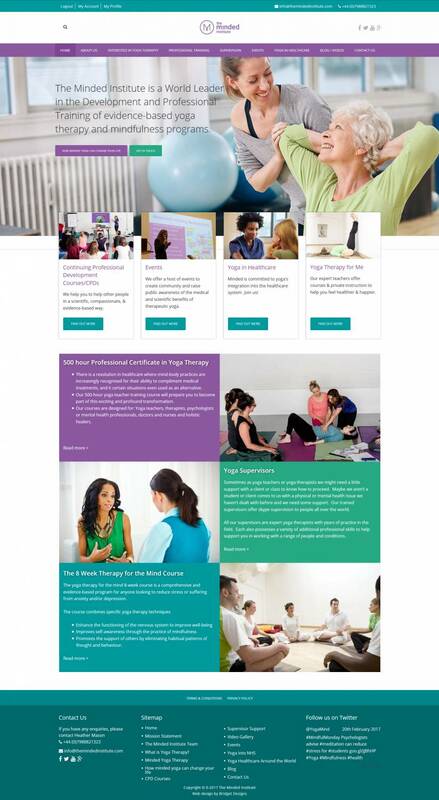 The site features a private registration and personal profile section for yoga teachers to advertise themselves, with the ability for them to add their own course dates as events,contained within a section aimed at the public looking for yoga courses. For professionals there is a training section, featuring several different types of training course that can be booked online. The site also has a bookable events system, video gallery, blog, an user submitted testimonials. Working with Bridget was a breath of fresh air. I have had some really bad experiences with web designers, in fact, I paid someone an exceptional amount of money and received horrible service and needed to switch. I came to Bridget on the recommendation of a friend in the industry. He told me I could trust her and that she is a brilliant designer. She was extremely warm and friendly, laid out realistic time frames, delivered on them, without incident, and provided me with a gorgeous highly functional site for almost ¼ of what my previous designer wanted to charge me. She’s a rare find and I cannot recommend her enough. I can finally exhale and my business is benefitting greatly from the work she did to create a high level site.